Those of you who are familiar with my website ABBA Omnibus know that it’s famous for gathering links to every known ABBA site on the internet. Due to circumstances, including the day job and working at ABBAWORLD, I haven’t had to opportunity to update the links since August last year. Until now, with 94 new links added, and 6 existing links updated (I originally announced 105 new links, but double checking them I found several duplicates). Ten years ago I started writing the ABBA on the Web column for the Official International ABBA Fan Club Magazine (then known as the Agnetha, Benny, Björn, Frida Fan Club). The first column appeared in the Fan Club Magazine # 65 in December 2000. This article appears in Magazine #105 December 2010 to commemorate the tenth anniversary of that first column. We are going to take a look at ten ABBA sites that I visit regularly for news, information, history, connecting with other fans or just for fun. ABBA Omnibus My own website, described in Elisabeth Vincentelli’s new book ABBA Treasures as “comprehensive” and on Carl Magnus Palm.com as “one of the best ABBA sites around”. ABBA Omnibus makes a good starting point as the Links section includes every single known ABBA and related site on the internet, categorised and ranked for easy access. It also includes an extensive discography, videography and bibliography, and a Songs section which includes every known ABBA song or working title, so you can follow the development of a song’s history from start to finish. Until recently it was known as ABBA World, but the name has been changed so that it is not confused with the touring exhibition. Worth regular visits for: links to every other ABBA site, and “everything ABBA”. The Official International ABBA Fan Club The fan club’s website is frequently updated with the latest and exclusive ABBA news and pictures. Of course it also includes lots of news and information about the fan club, its history, the fan club’s services, biographies of the ABBA members and other related projects. It also includes all the information you need about the annual ABBA Day, and wonderful reports and photos about previous years’ ABBA Days, so you can see how much fun we fans have every year. Worth regular visits for: ABBA and fan club news updates. abba4ever forum calls itself “The World-Spanning ABBA Fan Online Community”. It is a very active and friendly forum with members from all over the world discussing all aspects of our favourite group. abba4ever was started up after the forum on the official ABBA site was closed down a few years ago, but has since forged its own identity. icethesite is the unofficial “Benny Andersson and Bjorn Ulvaeus news site”. It is primarily dedicated to Benny and Bjorn’s careers including their musicals Chess and Kristina från Duvemåla, and of course Benny Anderssons Orkester, but will also include news about ABBA, Mamma Mia!, Agnetha or Frida. icethesite is often the source for breaking news and also includes exclusive content including occasional interviews with people involved in the boys’ projects. Worth regular visits for: Benny, Björn and news, news, news. ABBA for the record calls itself “the ABBA collectors web reference”. The site includes ABBA albums, singles, CDs, cassettes, videos, DVDs and other collectibles from Argentina to Zimbabwe, showing covers, inner sleeves, labels, booklets and other details. ABBA for the record contains over 2,600 items with more items added weekly, thanks to many fans who supply scans. Here you will find images of many rare ABBA records that you have probably only read about. The site also includes occasional special features on particular formats, records or years. Worth regular visits for: weekly updates with new ABBA records. ABBA on TV contains every (known) appearance by ABBA or the members on television, film and video. It is regularly updated with contributions from fans as more information becomes available. The site is a labour of love for webmaster Sara Russell, who professes her love for watching ABBA on television. Sara is also the author of the book The ABBA Guide to Stockholm. Worth regular visits for: checking out ABBA television appearances. ABBA Plaza is one of the longest running and most comprehensive fan sites on the internet, with detailed information about ABBA’s career and also personal touches from webmaster Robert, including his personal collection of rare ABBA items, and his encounters with ABBA members over the years. ABBA Plaza is worth visiting regularly for its “Fun” section, with many ABBA games including several different quizzes with various skill levels, a “weakest link” elimination game, a photo puzzle and much more. It also includes an International ABBA News section with links to various news sources. Worth regular visits for: regularly updated polls, games and quizzes. Mikory’s ABBA Blog is updated daily with historical newspaper and magazine articles and images including the “ABBA Pic of the day”, and also includes all the latest ABBA news direct from Sweden, often with the first English translations of articles from the Swedish newspapers. Carl Magnus Palm.com is the website of the author of many acclaimed ABBA books including ABBA – The Complete Recording Sessions and Bright Lights Dark Shadows – The Real Story of ABBA, among others. Carl Magnus has also worked a consultant for Universal Music Sweden for most ABBA projects for the past decade. His website includes fascinating additional information about those many ABBA projects, plus other book and CD projects he has worked on. Worth regular visits for: behind the scenes on latest releases. ABBAsite.com is, of course, the official ABBA website. It includes biographies on ABBA and the individual members, plus many of their artistic collaborators. It also includes a discography of available CDs and DVDs and a store to buy those CDs, DVDs, downloads, and other exclusive merchandise including t-shirts, caps and more. ABBAsite is also the first source for news on the latest official ABBA releases from Universal Music. You can sign up for a newsletter to receive the news as soon as it is announced. Worth regular visits for: official ABBA news and latest releases. Do you agree or disagree with any of these choices? Are there other ABBA sites that you would recommend to other fans? Let’s discuss here. When the announcement that the ABBA Museum project was to become the ABBAWORLD touring exhibition was made on June 2nd last year I faced a dilemma. My website was also called ABBA World – could there be two entities with the same name? I discussed changing the name of my site over dinner with some friends that night – by coincidence I was in Stockholm, having travelled there for what should have been the opening week of ABBA the Museum. We threw out some possible contenders for a new name over a couple of bottles of wine – sadly most of them forgotten the next morning. I thought it over for a long time. What new name would be appropriate and understandable to people, and how would I go about changing not only the website (all 900 + pages of it) plus the blog, Twitter, Facebook, and all the other parts of what had become quite a network of interconnected sites. Finally not long ago I was reading a book (1001 Inventions that Changed the World) and came across the word “omnibus”. Omnibus comes from the Latin word meaning “for all”. It’s the root of the word “bus” and can also mean “a collection of works on a similar topic brought together”. That struck me as the perfect new name for my website. So I started seriously investigating how to change the name and URL of the various ABBA World entities. Some of it proved to be incredibly easy, some of it difficult if not impossible. So on November 1st ABBA Omnibus was born. The conspiracy-minded will probably assume that Touring Exhibitions or Universal Music have “played the heavy”, insisting that the name be changed. But I can assure you that couldn’t be further from the truth. No one has ever approached me to change my website. This is entirely my own decision, made simply to avoid the growing confusion between the two entities. If you think it’s absurd that anyone could confuse the two, here’s an example: when tickets for the ABBAWORLD exhibition in Melbourne went on sale earlier this year, for a couple of hours the ticket site used the logo from my site. As I write this the changeover is incomplete, with some parts of the network yet to get the new name, and will probably remain that way for at least the rest of this month while I work though everything. Please save the new URL www.abbaomnibus.net in your bookmarks or favorites, and if you have a link to ABBA World on your website please update it to the new site. I’m very happy to say that the ABBA World blog has again been nominated for ABBA Plaza’s ABBA Site of The Year. To vote pop over to ABBA Plaza right now and follow the links. The winner will be announced on 1 January 2010. I’m slightly disappointed to see that three of the previous winners are in the final ten nominations. In the first few years previous winners were disqualified, giving more sites a chance. This is not a criticism of those sites – the previous winners are all among my favourite ABBA sites. There are over 1,000 ABBA websites out there (which, of course, you can find in the Links section of ABBA World), surely enough to fill ten nominations with fresh content every year. Early this year Yahoo! announced that it would be shutting down its free GeoCities webhosting service later this year. GeoCities will close on October 26 2009. GeoCities was one the first, if not the first, free webhost. Anyone could create their own website and not have to pay an ISP to put it on the internet. At its height GeoCities was probably the most popular hosting site, though it has been in decline in recent years as parent Yahoo! preferred to push paid services. Many ABBA fans created websites using the service – my own ABBA Phenomenon in Australia was hosted on GeoCities for many years, and I still have two other websites there, one with photos from a 1999 trip to Europe and one on artist Yoko Ono’s visit to Sydney in 2000. Those websites still on GeoCities will disappear on October 26th, which would be a shame. If you have a GeoCities account now is the time to move your site to a new webhost. 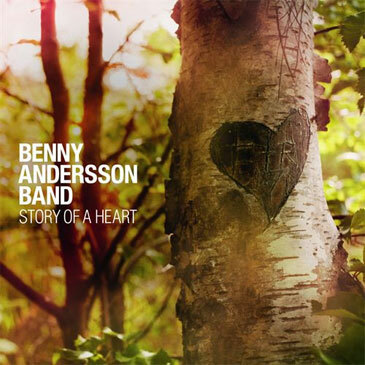 To celebrate the first international release by the Benny Andersson Band, Story Of A Heart, ABBA World is proud to present a new mini site dedicated to the band and the new album, along with the earlier catalogue by Benny Anderssons Orkester (BAO) and Benny Andersson solo. Visit the mini site at bab.abba-world.net/index.htm.